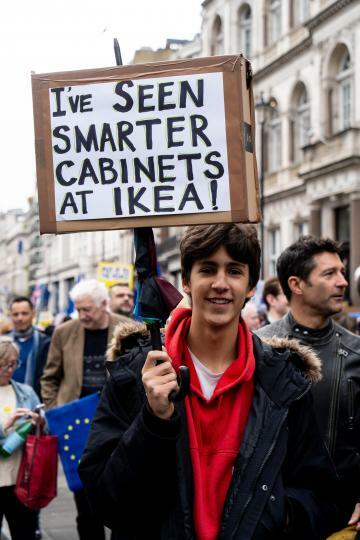 Organisers estimated around a million opponents of Britain's departure from the European Union joined what they called the "Put it to the people march", descending on the capital by road and rail from across the country. 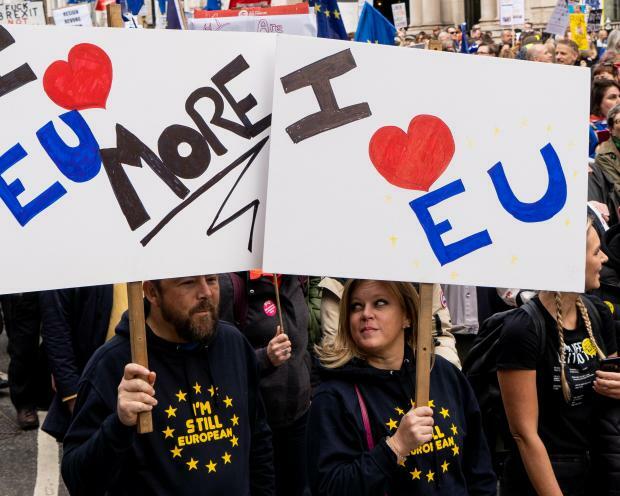 Wielding an array of anti-Brexit signs and EU flags, people first gathered at Hyde Park before walking the approximately two-mile route to Westminster -- whistling, cheering and chanting "people's vote". 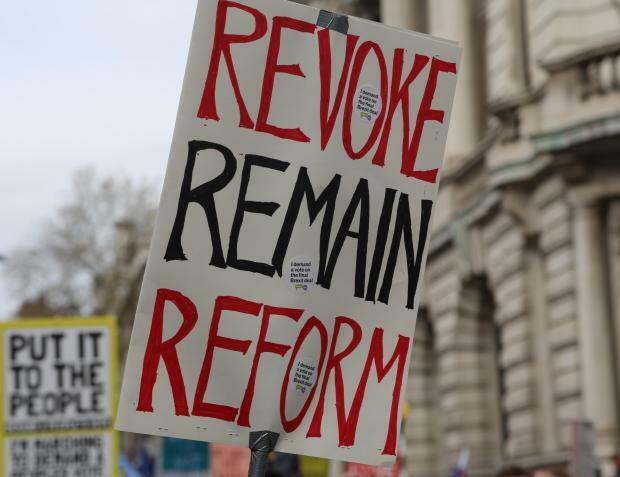 A host of other political figures also joined the demonstration, including Independent Group MPs who quit Britain's two mainstream parties -- the Conservatives and Labour -- earlier this year in protest at their Brexit policies. 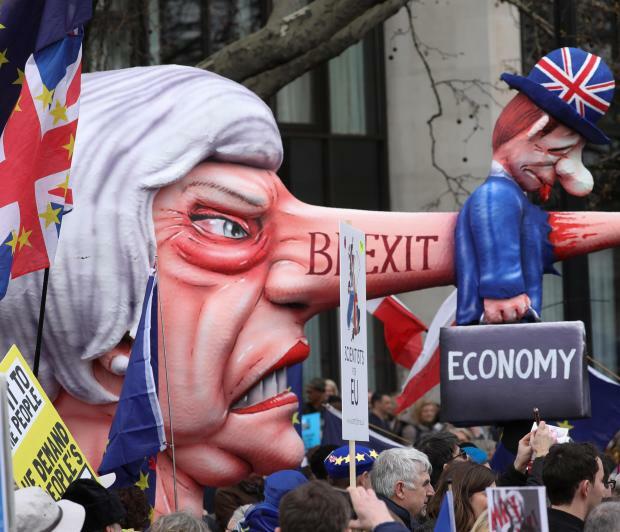 "One million marching for Britain's place in Europe -- a worthy fight," said Chris Leslie, one of the breakaway lawmakers. 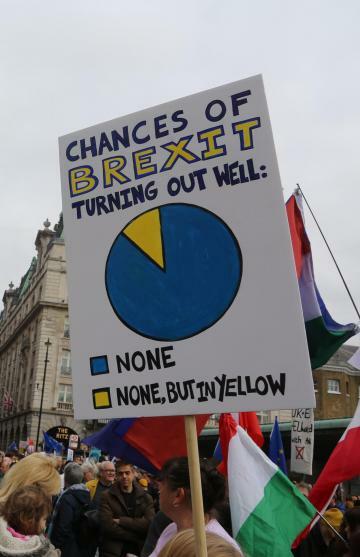 A majority of MPs voted against holding another nationwide poll on the issue earlier this month, and it remains a longshot bid by Remainers. "I was too young to vote in the last referendum," science student Calypso Latham, 19, told the BBC. 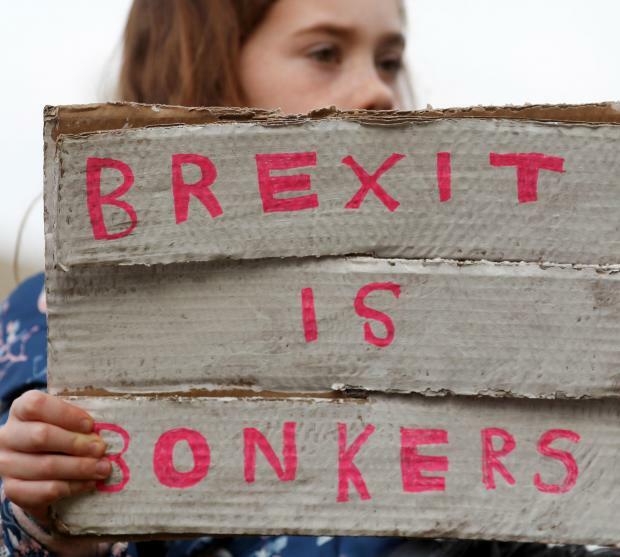 But if lawmakers defeat the accord again, as expected, London must outline a new plan or face a no-deal Brexit as early as April 12 -- unless it decides to request another extension and hold European Parliament elections in May. 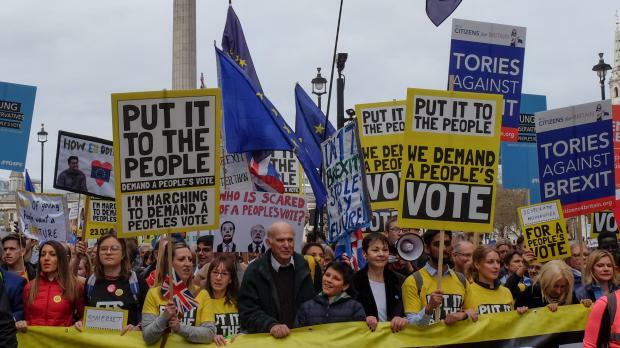 Hosted by the People's Vote pressure group, Saturday's protest follows a similar demonstration in October that drew an estimated half a million people. Organisers have arranged hundreds of coaches and even chartered a train to bring protesters from all corners of the country to the capital. "I am an old man and the outcome won't affect me -- but it will affect my family and many people that I know for years to come," he said ahead of the event. The prime minister has repeatedly ruled out holding another poll on the issue, claiming it would be divisive and renege on promises to honour the 2016 referendum result. Meanwhile the main opposition Labour Party appears divided on the issue. At its 2018 conference, it backed holding another poll as a last resort, while advocating staying in a customs union with the EU together with close alignment with its single market. But some MPs are fierce advocates of putting it back to the people, while others representing Leave-supporting areas in central and northern England, are bitterly opposed. In a sign of the splits, at least half a dozen Labour shadow ministers are set to join deputy leader Tom Watson at Saturday's march, while the party itself asked activists instead to help campaign for local elections due on May 2. Watson said he had now decided to campaign for a referendum "reluctantly" and would back May's deal if it was also put to the people. "It can only begin to bring the country back together again if we all have a final say -- and then live with the result," he said.